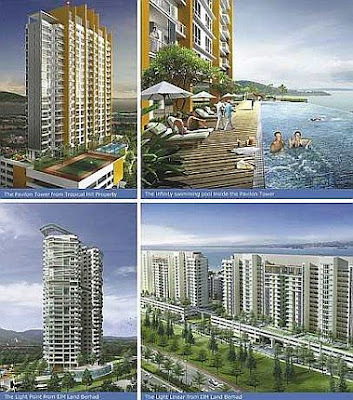 GEORGE TOWN: More than 600 high-end condominiums will be launched on Penang island before the year-end. Although local property prices have not been significantly affected, the volume of transactions has dropped slightly since January. At present, landed properties in Penang are still holding firm at RM600,000 to RM700,000. Mid-end high-rise properties are still priced between RM300,000 and RM400,000 for a 1,000-sq-ft unit, depending on their size and location. Henry Butcher Malaysia (Penang) vice-president Shawn Ong said to bolster sales during the current challenging property climate, zero interest financing packages introduced for purchasers by developers have worked quite well. “The latest residential product is the ‘mini superb condominium’. “It is dubbed ‘mini superb condo’ because of its size but they offer five-star facilities like normal super-condo projects. “Prices range between RM500,000 and RM1mil, depending on their size, location, design, concept, and specifications,” Ong said. The normal super condos are priced from RM2mil, have built-up areas of over 5,000 sq ft, and are located in prime locations such as Gurney Drive, Pulau Tikus and Tanjung Bungah. Market prices for such properties on Penang Island had generally remained stable, Ong added. “The up-market high-rise residential development trend on Penang Island has changed over time. Initially, these developments were more prevalent in the north-western and north-eastern parts of the island such as Pulau Tikus, Gurney Drive, Tanjung Tokong and Tanjung Bungah areas. “However, due to the availability of relatively lower priced land, good population catchments and better accessibility (improved infrastructure), the focus moved towards the south of island, for example, along and off the Jelutong Expressway, Sungai Nibong, Bayan Lepas Expressway, and Bukit Jambul areas,” he said. Ong said the demand for “mini superb condos” was expected to be encouraging given the sizeable young population in Penang and the higher household formation rate compared with the population growth. “Affordability is today supported by low interest rates and the innovative easy payment schemes provided by developers. “Investment interest in real estate is high given that alternative investments are less attractive today. “Since the island has limited suitable land for development, most investors and house buyers are confident in the longer-term growth potential of such value-added residential properties,” he added. Scheduled for launch by year-end are 568 mini superb condos by IJM Land Bhd’s The Light project, comprising The Light Linear, The Light Point, and The Light Collections schemes, located on a 16.8-ha freehold site off the Jelutong Expressway. IJM managing director Datuk Soam Heng Choon said The Light would offer unique themes and facilities normally found in super-condo projects. “The Light Linear project comes with fibre optic ICT infrastructure and a comprehensive range of home automation and recreational facilities, including a putting green. “The unique features are the green concept and water features in all the properties,” he added. The Light Linear units have built-up areas of 1,475 and 1,561 sq ft and are priced from RM522,000, or about RM354 per sq ft. The Light Point and The Light Collection residences offer bigger built-up areas ranging from 1,371 to 4,090 sq ft.
“Their pricing starts from slightly below RM1mil, which is still lower than the price of normal super-condo units,” Soam said. Another Penang-based developer, Tropical Hill Property Sdn Bhd, is scheduled to launch its mini superb condo project late this year. The 22-storey Pavilion Tower on a 1-ha site in Teluk Kumbar comprises a block of 99 units with built-up areas of between 1,600 and 5,000 sq ft. Tropical Hill Property managing director Datuk Loh Geok Beng said the units would be priced at about RM300 per sq ft.
“The low-density project, located close to the Penang International Airport and the Penang Bridge, is equipped with full recreational facilities including a swimming pool and community hall that can accommodate 500 people,” he said. When times are bad, property investors, more so those with a lot of cash, will look at opportunities beyond the country instead of just locking their money in the local market. With that, there appears to be a rising trend among Malaysians to invest in properties abroad, more notably those in Singapore, Australia and Britain. The lower property prices, due to price adjustment in the exchange rate, makes it even more appealing. Reflecting the growing interest is the fact that real estate agents have been getting numerous inquiries pertaining to property purchases abroad. “The closest to our market which has attracted interest is Singapore, where property prices at the heart of the republic, at Orchard Road, saw some downward price adjustment. London is another popular investment destination especially considering the adjustment in exchange rate from RM6.95 to £1 (about a year ago) to RM5.82 today in addition to adjustment in property prices there in view of the economy,” says real estate agency S.K. Brothers Realty (M) Sdn Bhd general manager Chan Ai Cheng. Chan opines that the main reason investors are considering these markets is the upside potential in their economic recovery. “For instance, for a location like Orchard Road in Singapore, the moment the market recovers, this location would be the first to benefit. In good times, it would not be possible to own something at Orchard Road at the current prices seen in the past six to nine months” she says, adding that some look at overseas property investment as a diversification of their investment portfolio. The majority of purchases by Malaysians in Singapore are those who work in the republic. When it comes to Australia, the biggest motivation to buy properties there would be because their children are pursuing education there. Property consultant Savills Rahim & Co managing director Robert Ang concurs that local property investors are eyeing British and Australian properties to take advantage of the fall in value of the British pound. Condominium prices in Singapore, Britain and Australia, he says, have declined between 20% and 30%. Meanwhile, Khong & Jaafar Sdn Bhd managing director Elvin Fernandez notes that Singapore is seeing some pick-up in demand and prices. “This comes with a general feeling that the downslide in the crises has been arrested,” he says. “Australia is also a destination that investors are eyeing for long-term prospect because the Australian market seems to be quite stable and not much affected by the credit crisis,” says Y.Y. Lau, executive director of YY Property Solutions Sdn Bhd (in association with Cushman & Wakefield). She adds that corporate investors are becoming interested in emerging markets such as Vietnam. Locally, Fernandez says high-end condominium prices in Kuala Lumpur have dropped by some 10% to 15%. “This is not unexpected as the prices ran up substantially in 2007 and early 2008, ahead of fundamentals like rental support. “Prices for high-end condominiums in Kuala Lumpur, should, in my opinion be considered sustainable if net annual returns are about 6% at the point of purchase,” he says. As for landed property, the market appears to be holding up pretty well in general. “Even in more volatile markets like the Kuala Lumpur City Centre (KLCC) area, prices are still above launching prices two to three years ago,” says Chan, adding that the asking price a year back was much higher. Another reason why the prices of properties in the suburbs have held well is because most involve owner occupation and for many, they are at the tailend of their loan repayments to the banks. “Whereas units at the KLCC area could be more for investment purposes than owner occupation,” she says, adding that such investors will not hesitate to dispose of their investment assets in Malaysia, if necessary. Fernanadez says that going forward, local property market will face challenges if economic growth is not strong as, on the supply side, there are a large number of developers who depend a lot on keeping their outfits humming and this will be threatened if demand is not robust. According to Cushman & Wakefield Research’s latest report for June and July, the first quarter of 2009 for real estate investment sales in Asian markets was pretty dire compared with the first quarter in 2008 and 2007. “Despite the gloomy evidence, our brokers in Asia can see markets starting to move in the right direction. One of the advantages Asian markets have is the wider-spread use of strata-title office space available for purchase by occupiers for their own use,” the report says. The report also says the economies in Asia are constantly growing, but the growth rate is slower and only increases in speed again after passing the turning point. “This means that there is a continuing demand for real estate space all the way through the cycle. It’s just that the rate of demand is not as high as it was,” it adds. In Europe, the report says property and bond markets have continued to deliver weak performance. Property in Eastern and Western Europe has seen a further quarter of negative growth with the prime values in the West down around 6% and 19% in the East, as an acceleration in rental declines has started to take over from yield increases, the report says. As developing countries around the world try to outdo each other to attract foreign investments in the aftermath of the global financial crisis in the coming months, competition is expected to heat up in all spheres of the global economy. Right in Malaysia’s backyard, there are already tough competitors vying for the foreign dollars. Vietnam, dubbed the little China, is attracting substantial foreign interest as the country has very liberal rules for foreign investors. Others that are also making big headway include Thailand, Indonesia and the Philippines. Although with the latest liberalisation measures announced by Prime Minister Datuk Seri Najib Tun Razak, the country’s investment and property landscape for foreigners has become rosier overnight, there is still much to be done to catch up with the rest of the world. The Federal Government should be commended for being decisive in heralding the policy initiatives to further sharpen Malaysia’s competitive edge and attract foreign direct investment (FDI) to the corporate and real estate arenas. As in all government policies, the success of the measures will depend on the efficacy and expediency in their implementation. Unless the whole government machinery, both at the federal and state level, moves in tandem with a single-minded focus, nothing much can be achieved. This is especially true in the case of the liberalisation of property purchases by foreigners as all land-related matters, including real estate ownership transfers, are under the purview of the state governments. Under the latest liberalisation of the property market, approval from the Economic Planning Unit (EPU) in the Prime Minister’s Department will only be required for transactions involving a dilution of bumiputra or government interests for properties valued at RM20mil and above. Foreign interest acquisition of commercial property and industrial land valued at RM500,000 and above will not require approval. If the measures are implemented smoothly and expeditiously, the measures should promote greater foreign funds inflow into the property sector. Industry players however lament the absence of incentives for local property buyers in the latest government measures. As most foreign investors are still mired in their own problems back home, it will take some time before they finally “nibble at the carrots” offered in the latest government liberalisation measures to promote foreign investment in property. For foreigners to come in significant numbers, the global economy should already be back on its feet and on its growth path again. There’s also many fire sales in renowned real estate cities like London and Dubai, so foreigners may not be lining up to come in to Malaysia just yet. While waiting for them, local buying activities will keep the market going and it’ll be beneficial to offer local investors some incentives as well. Hopefully in the spirit of 1Malaysia, all Malaysians will team up as a united force to face a more competitive new world order after the global crisis. To reap their full benefits, all the governing authorities should implement the measures with zest and conviction. Time and tide wait for no man. So is the world that is going through unprecedented changes and will not wait for Malaysia to be ready. Besides making it more lucrative for inflow of FDIs, it is also important to have in place more enabling policies to promote a more level playing field for Malaysian entrepreneurs to thrive and contribute to national growth. Instead of competing on the lower rung of the economic chain that involve labour-intensive activities, it is certainly timely for Malaysia to revamp its whole economic structure and move up the value chain to ensure greater sustainability and growth in the coming years. By encouraging business and manufacturing activities that compensate higher wages, there will be more wealthy Malaysians to ensure domestic demand will drive and sustain the country’s economic growth. This will be a prerequisite of sorts to place Malaysia on a high growth trajectory. As Vision 2020, when Malaysia will be joining the ranks of other developed nations, is less than 11 years away, it will be crucial to look at ways to harness and develop the people’s potential. It will certainly help to start with the country’s education system to promote more creativity and problem-solving abilities among our students. Instead of memorising past achievements of long gone civilisations, it will be more useful for our young Malaysians to sharpen their creativity and problem-solving skills as they will need much of these skills to do well in life, if the latest unravelling of global financial turmoil is an indicator of more challenges to come. If all qualified students who performed well in their examinations are assured of places in the local universities to pursue courses of their choice, it will go a long way to build up a pool of highly qualified professionals to meet the needs of the country’s different economic sectors. The country can certainly do with a few more public universities to meet the needs and aspirations of Malaysian students. Many bright students have to put their studies on hold and join the workforce because their families could not fork out the high cost for them to study at the private institutions. As the saying goes, charity begins at home. Until our public universities are able to meet the needs of our own students, the places should not be opened up to other foreign students yet. ·Deputy news editor Angie Ng hopes that the Prime Minister will make it his next priority to allocate funds for more public universities to be built for all qualified Malaysian students to have the opportunity to pursue tertiary education. For the past several months, Malaysians have been toying with the idea of having a bit of England, predominantly London, to call their own. Be it aspirational or otherwise, they have cited several compelling reasons for that interest. The first is the drop in property prices in Britain. The second is the devaluation of the British pound. A third is their children, who are studying there. Added to the above is Britain’s base lending rate, which has fallen to 0.5%, the lowest “in decades”. Although unemployment is expected to climb to 3 million from the current 2.5 million (unemployment rate: 7.1%) and the economy looks bleak for the next few years, there is a strong interest internationally because of the currency advantage. Buyers are from the Middle East, Europe, Ireland, Russia, Asia and Africa. Jones Lang LaSalle director and head of residential James Thomas says that because the majority of London’s seven million population are from outside London, there is always a demand for housing. Between now and 2026, about 33,000 extra households are expected to be added annually to the current 3.8 million there today, he says. On the interest shown by Asians, Thomas says there was a time before the 1997 Hong Kong handover when London was considered a safe haven. 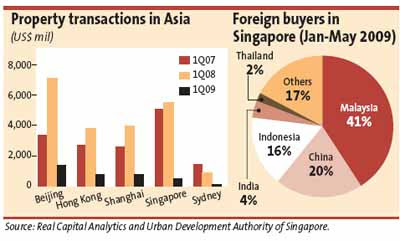 That was when the Hong Kong and Singapore buyers featured very strongly. Today, Malaysians do not want to be left out. “When property prices began to escalate in 1998, many felt the city was getting too expensive. They changed course and bought in Asia. Now, there is a resurgence of interest from Asia. Thomas says the interest is typically for houses worth £400,000 to £1mil with one to three bedrooms. Asians tend to like places which have nearby amenities, access to the underground and near universities. Some of them look at areas around Chinatown, he says. Interest from Malaysians emerged when the pound dropped 28% in the last quarter of 2008. The pound dropped from about RM7 to £1 before the fall of Lehman Brothers to an all-time low of RM5 to £1. Although it has clawed its way up today to RM5.80 to £1 (a drop of 17%), the thought of having a bit of London continues to be enticing. They have called real estate agents, attended exhibitions which have made their way to Kuala Lumpur and some have gone over to check out the sites. On the supply side, British developers are making their way to India, Hong Kong, Singapore and some to Kuala Lumpur. The questions buyers ask are where and what to buy? Holding these two questions together is the all-paramount teaser – is it time to buy? Before going further, London property prices are not representative of Britain, anymore than Kuala Lumpur is of Malaysia. Even in London itself, there is the prime central London and the Greater London location. Since March this year, Russians, Middle Easterns, South Africans and Europeans, especially the Italians have invested billions in prime and greater London area, says Savills, one of Britain’s largest property agencies. This does seem rather exciting from a property consultant’s perspective, especially when the number of transactions have halved over the last year. Says its director Edward Lewis: “A lot of the activities are driven by equities. There are today three schools of thought whether it is time to buy. The first is that there may be room for prices to fall further. A second view is that the sector is picking up. The third is that, London is still London, and now is as good a time as any. Thomas says the trend in price falls has eased considerably this year and may even be turning to positive growth although this is too early to say. “The number of sales and the number of enquiries continue to improve,” he says. While an earlier housing market recovery is most welcome, there are reasons to question the sustainability of these latest trends, he says. A Jones Lang LaSalle report UK Residential Market Forecasts says actual first quarter 2009 price falls were in line with their forecasts. Secondly, Britain and the global economies are still dire. Third, it is unlikely that the full impact of declining employment has yet to hit the housing market. It is also possible that the current fillip is due to the sharp fall in interest rates, improved affordability and spring/summer market. Savills’ Lewis says transactions today are back to March 2008 levels and they are not getting that much stock coming on the markets. “There is a possibility that you may be able to buy 40% to 50% lower because of the combined weaknesses but that door is fast closing because the pound is strengthening. There is now more interest which culminates in actual transactions. How long it will last remains to be seen,” he says. It is important to note that when property agents say that properties have fallen by X%, they are using the peak of 2007 as a yardstick when London properties were at an all-time high. Britain’s properties have been trending upwards at a phenomenal rate for several years beginning from 1998 to 2007 after a lacklustre 8.5 years from 1989 to 1998. To give an idea of how much housing cost has escalated, the average cost of a house in the mainstream market, non-prime area, in England and Wales has more than doubled to £160,000 today, compared with £67,000 between 1989 and 1998 when housing cost reached a plateau. International buyers are mainly interested on prime central London and Greater London area, essentially zone 1 and 2. Prime central London includes areas like Belgravia, Knightsbridge, Chelsea, South Kensington and Mayfair, areas bordered by the inner rectangle of London’s underground, its main public transport system. Between the first quarter of 2008 and 2009, the prime central London prices were down by 22%, a markedly steeper decline than anywhere in Britain, which prompted much interest from international buyers, the report says. Despite the recent pick-up seen in May and June figures, the real estate consultancy continues to expect further significant price falls in prime central London and Greater London this year and does not expect the current resurgence in confidence to force prices higher. “Prime central London prices may fall in the region of 14% to 18% this year, representing a slight improvement compared to our previous forecasts. Prices in Greater London is expected to fall between 15% and 17%. Thomas, of James Lang LaSalle, says the 2010 economy outlook is uncertain although prospects have certainly brightened. “We have not boosted our 2010 forecasts as a result of the more positive economic survey. Rising unemployment remains an issue. “The fact that house prices will be 28% below their 2007 peak will encourage new demand. “We believe the first half will continue to see prices fall and subdued activity followed by increased activity and a diminishing, if not curtailed, price falls in the second half of next year. The base lending rate is also expected to increase steadily from 0.5% at the end of 2010 to about 3.5% by the end of 2013 before returning to equilibrium levels of 4.5% to 5% post 2013. Thomas says he does not expect the average British house price to recover their third quarter 2007 peak levels until the third quarter of 2015. But because the city will be leading the economic recovery and will be boosted by the Olympic and Paralympic Games in 2012, it will see higher price growth compared to overall Britain. There are some places where only the rich can afford, where politicians, footballers and Russians congregate. Some of London’s prime areas include Notting Hill, Chelsea, Bayswater, Kensington, Knightsbridge, St John Wood, Hyde Park and West Hampstead. Savills director Edward Lewis serves up some alphabet soup to give a broad overview of the different areas and how they rate. Instead of an A or B, the more popular letters in macroeconomics today are V, U, L and W. These letters are more graphic and illustrative of the shape of the recovery. U refers to the market having a longer arc of bottoming before recovering. A V recovery shows the speed and strength of the bounce back mirroring the fall. An inverted L shows a long period of no movement or stagnation, an example being the Japanese economy, while a W signifies a period of ups and downs. “When someone says the property has dropped 40% to 50%, they are talking about somewhere in a poor part of London, or city in Britain. I would suggest Malaysians concentrate on quality properties,” says Lewis. U: Mainstream London, Greater London, Canary Wharf, Wimbledon, Fulham and Richmond (both of them good family suburbs). More interest since January, 2009. V: Prime London, Knightsbridge, Chelsea, Mayfair, Hyde Park, Oxford Circus, Bond Street. More interest since March 2009, but this does not mean it is going to be easy. L: Poorer suburbs of London, East London, Leytonstone, Hackney. May buy cheaply today but may take five to 10 years to recover because of repossession as a result of unemployment. The building of a stadium in Leytonstone in time for the London Olympics will help to push up prices. Will a W surface for the London market? “We do not know because we do not know the shape of the curve. At the moment, we have turned the corner but only time will tell whether it is sustainable,” says Lewis.